Generally speaking, teachers have considered themselves as low-salaried government employees as compared to other government agencies. In that reality, they have wanted to have a reasonable remuneration to their copious job, discounting the danger, the hazards that they're facing from day-in to day-out in line of their duties. 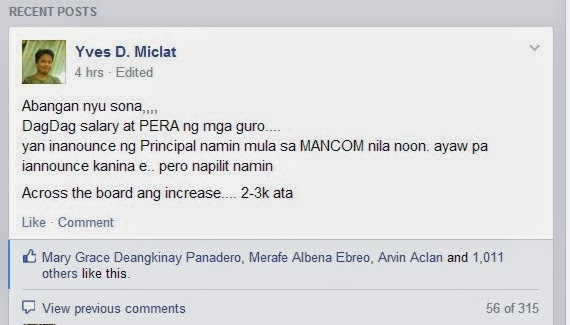 Some concerned teachers have manifested their true sentiments on this dismal scenario of their present situation when Sir Yves D. Miclat posted a reminder on what to keep track during the PH President's state of the nation address (SONA) comes Monday afternoon. Therefore, I was a bit the center of the discussion in TAGA-DEPED AKO, a closed group page in the Facebook. I was totally misunderstood and misconstrued of my point of view by the members of the said group. It seemed that they regarded the situation personally, and to the extent of dragging me unprofessionally. As I mentioned earlier, this hullabaloo stemmed from one member who posted an announcement that there is a plan for an across the board increase of two thousand to three thousand pesos in the monthly salary and in the emergency allowance of the public school teachers. The message is written in Filipino in which the above statement summarizes the whole context of the message, which is focused on across the board salary increase which could be one (?) of the features in the SONA of the President Noynoy Aquino on Monday, July 28. The screenshot of this message is below. I personally commented that this particular increase of salary of the teachers would give them less benefit, rather an added burden for them. I was referring to the existing loans of some teachers. If this will be effected, their credit line will tend to become bigger and it is not good, I said. Numerous negative comments gradually came pouring, until it belittled me, insulted me, among others. Those who were leading for their strong comments, Here the screenshot their comments to substantiate the hot issue. I have humble myself and get rid of all of my comments for proper decorum. Thus, I have made myself clear that everything has led to the point of misunderstanding, discordant of thoughts and ideas. I have admitted that I have caused the group trouble and I was very remorseful about about. And I said once and for all, "I AM VERY SORRY." I am so thankful for the following teachers who indirect accepted my apology through their "likes" made in latest comment I posted for being sorry about it. They are Fred Detosil, Analie Vergara, Abram Kiko Bunso, Titay Dela Cruz, Lizzie Quinisio, Julianice Oaday Azalapga, Christophe viernes, Cynthia Pichay Domingo, Richelle Mateo, Jane Mendoza, Marife Tayon Santos, Yves D. Miclat, Len Len, Bong Bagamaspad, and Jomelyn Tuazon Lundag. Thank you also to Mam Lhy Timuat Servo for her moral support. personally i do not understand why those individuals maligned you sir (as i have not read yet all your "thoughts." but one thing is for sure, they had generalized your point without probing any further... stay strong as i think you already are!!! Thanks you very much Dexter... at least you got what I mean. It is really intended for the teachers' credit line. I don't want them to be buried in the quagmire of gigantic or monstrous loans.